Johannesburg, South Africa: Australia, Spain, Germany and Belgium all booked their tickets to the Odisha Hockey Men’s World Cup Bhubaneswar 2018, winning their respective matches on men’s quarter-final day at the Hockey World League Semi-Final. Reigning world champions Australia cruised to a 4-0 victory over Egypt to ensure that they will be heading to India to defend the title they won three years ago in The Hague (NED). Spain overcame Ireland to maintain their remarkable record of having qualified for every men’s World Cup to date, with 2006 world champions Germany proving too strong for France to seal their berth. Belgium’s Red Lions were the fourth team to guarantee their World Cup ticket, taking a 2-0 triumph over New Zealand’s Black Sticks. The competition semi-finals in Johannesburg will take place on Friday 21st July, with Spain playing Germany at 16:45 South Africa Standard Time (UTC +2) before a mouthwatering meeting between Belgium and Australia gets underway at 19:00. In the all-important 5-8 play-off matches, Egypt will take on New Zealand at 12:15 while Ireland play France at 14:30 as the race for fifth place and the subsequent World Cup ticket that comes with it continues. As well as qualifying for the World Cup, the four winning teams from today’s matches are now also guaranteed to play in the Odisha Hockey World League Final, which also takes place in Bhubaneswar, India at the end of the year. Australia, Spain, Germany and Belgium join Netherlands, Argentina and England – who took the first three positions at the Hero Hockey World League Semi-Final in London – as well as host nation India. Malaysia, who finished fourth in London, miss out on taking the highest ranked fourth placed finisher spot on the grounds that all of the semi-finalists in Johannesburg are placed above them in the FIH Hero World Rankings. Australia (FIH Hero World Ranking: 2) were the first team to claim their tickets to the World Cup and World League Final, scoring four times without reply against an Egypt (WR: 19) side that has come a long way in a short space of time following their 10-0 defeat against Belgium at the start of the competition. Jeremy Hayward put the Kookaburras on the road to victory with a tenth minute penalty corner, with Jake Whetton scoring a double either side of a rare goal from the influential Matthew Swann. The Spain (WR: 10) versus Ireland (WR: 9) quarter-final was the closest of the day, with the Green Machine having numerous scoring opportunities but only managing to make one mark on the scoreboard. Spain took the lead just after half time thanks to a penalty corner from Ricardo Sanchez, with Alan Sothern restoring parity with a perfectly executed drag-flick a minute before the end of the third quarter. 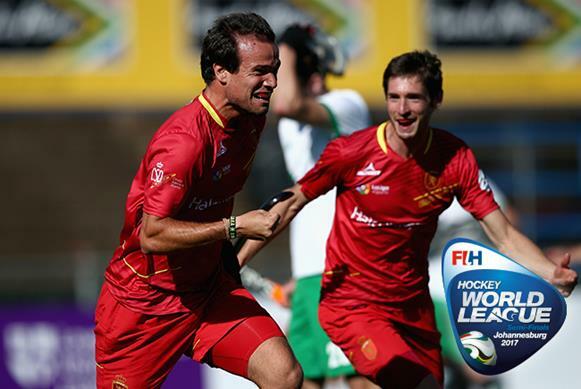 However, Irish hearts were broken just a minute later when an unmarked Alvaro Iglesias smashed home what proved to be the winner, putting the Red Sticks into the World Cup and World League Final. The third team to seal their double ticket to India was Germany (WR: 3), with Tom Grambusch putting Die Honamas in the driving seat against France (WR: 17) by converting a penalty corner effort in the final minute of the first quarter. Rising star Timm Herzbruch scored a superb double either side of half time to effectively seal the win, with Marco Miltkau adding a fourth seven minutes from the end. A penalty corner from Nicolas Dumont deservedly put France on the scoreboard, but it was Germany’s day. In the final match of the day, Belgium’s Red Lions (WR: 5) produced an explosive first quarter performance against New Zealand (WR: 8). Sebastien Dockier opened the scoring after three minutes with a slap-shot before Tom Boon doubled the advantage thanks to a fierce backhand shot just two minutes later. To their great credit, the Black Sticks firmed up their defence and gave a strong showing after half time, but could not deny Belgium a 2-0 win. Thursday 20th July is women’s semi-final day at the University of the Witwatersrand, although it is not only the final four matches that are of interest. The first match of the day is the 9-10 classification contest between Poland and Chile, which gets underway at 10:00 South Africa Standard Time (UTC +2). That meeting is followed by the two 5-8 play-off matches, with India playing Japan at 12:15 before South Africa meet Ireland at 14:30. The two winning teams will not only meet in the 5-6 classification match, they will also be assured of places at the Hockey Women’s World Cup London 2018. This is because the highest ranked sixth place finisher from the two Hockey World League Semi-Final events in Belgium and Johannesburg is now certain to come from the competition in South Africa, with Italy – who finished sixth in Brussels – being lower ranked than all four teams that are competing in the 5-8 play-off matches. In the competition semi-finals, Germany play Argentina at 16:45 with England and USA going head-to-head at 1900.